Larrington, Carolyne, Judy Quinn & Brittany Schorn (eds.) 2016: A Handbook of Eddic Poetry. Myths and Legends of Early Scandinavia. Cambridge: Cambridge University Press. xii + 413 pages. The overabundance of information at our fingertips today has stimulated a new era of handbooks and encyclopaedias. Whether these take the form of a concentrated compendium or a wiki, they promise itemized synthetic overviews of particular topics in articles of varying scope that may be tailored to a degree of specialization or to a particular audience. A Handbook of Eddic Poetry. Myths and Legends of Scandinavia (2016) is the first such compendium focused on so-called ‘eddic’ poetry, i.e. Scandinavian poetry in meters descended from the common Germanic alliterative poetic form. The subtitle of the collection underscores that preserved eddic poetry is predominantly linked to mythological and heroic narratives. Today, research on eddic poetry has so many facets and is advancing in so many directions that specialists cannot keep up with the sheer volume of research being produced while students are often at a loss regarding where to start in the face of the ever-growing research literature. A Handbook of Eddic Poetry offers a rich resource that can provide an excellent foundation for students while new perspectives that it offers will be of value to experienced scholars. The Handbook is largely developed from the two workshops organized by the Eddic Network (founded by the editors) in 2013 and 2014 at St. John’s College, University of Oxford. The Network and its activities were organized in response to other current projects. Scholarly convention divides the Old Norse corpus into two categories, ‘eddic’, referring to genres of tradition-based knowledge like epic, aphorism and riddle (the associated poetic form also being found as a mode of speech of supernatural beings), and ‘skaldic’, referring to situation-specific verses and poems identifiable with particular poets or speakers and their perspectives. The massive Skaldic Project is producing an annotated edition of the skaldic corpus and has also stimulated interest in and attention to skaldic poetry. On the other hand, the DFG-Projekt Edda-Kommentar is a correspondingly massive annotated edition of the classic eddic corpus. The latter project is within a particular school of German scholarship which takes stances to the poetry and its transmission. Some scholars find these stances problematic and have been concerned that the resulting Kommentar edition will become such a central resource that students will take those stances as hegemonic. The Eddic Network anticipated a rise in interest in eddic poetry, which it hoped to stimulate. The Handbook is intended to meet the need for such a resource which is already felt today, and it offers fresh and diverse views that can be considered in dialogue with the poem-specific apparatus of the Kommentar. The creation of reference resources in Old Norse Studies is not new. Old Norse Studies is a field concerned with the language and culture of medieval and Viking-Age Scandinavia and its diaspora. As such, the field is extremely broad in the diversity of subjects addressed and spills into interdisciplinary discussion in a number of directions. Moreover, vernacular written manuscript sources, such as those in which eddic poetry is preserved, are products of a technology that was carried with the spread of Christianity. Thus, research on eddic poetry as well as sagas and ‘skaldic’ or court poetry concern contemporary meanings and uses of both the poetry and ‘pre-Christian’ heritage in Christian societies where it was written down as well as how these sources may or may not shed light on cultures, traditions and their evolution in the Viking Age. Finding one’s way through the labyrinth of literature in the field can be challenging indeed. The Handbook follows on the growing trend to produce article-collections. The compendium is comparable to A Companion to Old Norse–Icelandic Literature and Culture (McTurk 2001) but with a more specific focus. It thus participates in the turn away from earlier weight on bibliographic resources accompanying the articles of the still-valued Old Norse–Icelandic Literature: A Critical Guide (Clover & Lindow1985). An introductory reference resource focused on eddic poetry and its scholarship has long been wanting in the field and this volume with contributions by such a splendid group of scholars is welcome to see. The Handbook is organized with an introduction, eighteen thematic chapters, consolidated bibliography and an index. Carolyne Larrington’s short introduction orients the reader to the volume and its contents. The eighteen chapters are not grouped into larger sections. Margaret Clunies Ross opens the thematic chapters with “The Transmission and Preservation of Eddic Poetry”. Joseph Harris follows this with a review of “Traditions of Eddic Scholarship”, which I found a highlight and a must-read for students. Judy Quinn’s “The Editing of Eddic Poetry” presents an illustrative series of examples of how editors’ choices and reliance on their editions can affect interpretations of the poetry. In “The Dating of Eddic Poetry”, Bernt Ø. Thorvaldsen offers a useful introductory discussion of different criteria that have been used to date poems and problems with them especially in light of the oral background of the poetry. Terry Gunnell advances the perspective on the poetry as more than words on a page in “Eddic Performance and Eddic Audiences”. He discusses different potential aspects of performance contexts and importantly highlights the phonic texture of the poetry, the roles of sounds in the aesthetics of aural reception. These latter two chapters connect back to questions of the poetry’s transmission. A group of chapters concerned mainly with content come next. John Lindow’s “Eddic Poetry and Mythology” is a concentrated overview that may be the best such synthesis he has produced across his many years of working with these topics. Jens Peter Schjødt presents and illustrates a discourse-based approach to “Eddic Poetry and the Religion of Pre-Christian Scandinavia” that circumvents problems of several earlier uses and interpretations of this corpus. Carolyne Larrington then discusses “Eddic Poetry and Heroic Legend” from stories of pan-Germanic heroes to the generation of new heroes and entertaining stories using both elements of the inherited traditions and other stories arriving in Scandinavia. I found Stefan Brink and John Lindow’s “Place Names in Eddic Poetry” extremely interesting and valuable as a dense, detailed review and discussion, although I thought the topic quite specific for a devoted article in a handbook, especially when personal names or metrical lists (þulur) of names do not receive corresponding attention. The Handbook then includes chapters on connecting preserved eddic poetry with evidence in the archaeological record. Lilla Kopár gives a very nice introduction for students of both poetry and iconography in “Eddic Poetry and the Imagery of Stone Monuments”, where her underscoring of potential regional variation in traditions is particularly appreciated. In “Eddic Poetry and Archaeology”, John Hines presents a useful review of scholarship and discussions from the perspective of archaeology; then, for relating archaeological and textual sources, he concentrates on “material semantics”, the meaningfulness of things and how sources from different fields can offer complementary perspectives to our understandings. The following five chapters of the Handbook concentrate on language, form and techniques or devices used in the poetry. Brittany Schorn wrestles with the difficult questions surrounding “Eddic Modes and Genres”, turning attention away from genres as prescriptive text-type categories to the variety of resources for expression available to Old Norse poets. R. D. Fulk’s dense but accessible introduction to “Eddic Metres” is a valuable introduction to the formal side of the poetry. Brittany Schorn then continues with a chapter on “Eddic Style”, with sections on “Diction”, “Form” and “Dialogue and Poetic Voice”. I must admit that I found it a bit jarring to read Fulk’s chapter between the two intimately related chapters by Schorn, as a consequence of which I felt like her discussion in the section on “Form” was somewhat redundant to the meter chapter even if it was introducing new and useful perspectives. Focus narrows in Judy Quinn’s discussion of “Kennings and Figurative Language in Eddic Poetry”, concentrating on meanings and intertextuality in the general sections and giving attention to ambiguities in interpretation in the case studies. I was very excited to read Maria Elena Ruggerini’s chapter on “Alliterative Lexical Collocations in Eddic Poetry”, which offers something quite new to eddic scholarship, although I was surprised by its presence in the Handbook: this chapter struck me as an article about innovative new research on a very specific topic. The chapters on kennings and alliterative collocations are both valuable works of scholarship, but they again elaborate specific aspects of poetic diction as opposed to others (e.g. synonymy, syntax, parallelism, echo-words) that – in the context of a handbook – I would have expected to be sufficiently covered in a general discussion of diction. The penultimate chapter turns to an aspect of culture reflected and manipulated in the poetry that has been especially charged in scholarly discourse: gender. David Clark’s and Jóhanna Katrín Fríðriksdóttir’s “The Representation of Gender in Eddic Poetry” is a well-rounded introduction with a nice review of gender discussions in Old Norse Studies. The collection is brought to a close by Heather O’Donoghue’s “The Reception of Eddic Poetry”, which offers an insightful look especially at early reception up to the twentieth century. The quality of individual contributions to the volume is excellent. Practically speaking, the Handbook is a collection of articles by different authors. Individual authors vary in the breadth and orientation of their contributions, and chapters also seem to vary in the audiences to which they are oriented. For example, the title “The Editing of Eddic Poetry” and this chapter’s position in the book led me to expect a broader discussion of motivations for editorial choices and when they are or are not justified, in addition to potential negative consequences of editorial emendations. Whereas chapters like “The Representation of Gender in Eddic Poetry” present ostensibly more neutral overviews, “Eddic Poetry and the Religion of Pre-Christian Scandinavia” has a more programmatic slant (which is not itself a bad thing). Chapters like “Traditions of Eddic Scholarship” will be accessible to students with only superficial knowledge of eddic poetry whereas “Eddic Modes and Genres” seems oriented to readers already familiar with these discussions. 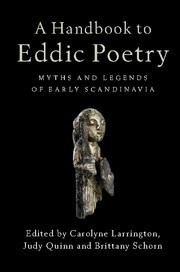 In the latter chapter, the scholarly convention of a binary divide between ‘eddic’ and ‘skaldic’ poetry is presumed as general knowledge; skaldic poetry and its relevant characteristics are not introduced and the chapter is so far removed from the Handbook’s earlier discussion of the eddic–skaldic split that only more experienced readers will benefit fully from what the chapter has to offer. The diversity of authors’ approaches will itself be an introduction for students into the diversity within the field, but I think the collection would have benefitted from addressing this diversity more explicitly. For example, discussions emphasizing the oral background of the poetry and those which seem to treat and interpret the texts like modern literature each reflect assumptions, sometimes wholly implicit, about how the poetry operated and varied in society. Students would benefit from an address of the compatibility or incompatibility of these approaches and their assumptions, which could offer perspective on how to relate them. Nevertheless, cohesion of the collection is supported by the organization of a number of chapters on a structure of overview sections followed by one or more illustrative case studies. The chapters are also extensively cross-referenced, highlighting their interconnections. Individually, the quality of the chapters is extremely high; they are simply diverse, and different chapters will be of greater or lesser value and accessibility to different audiences. I very much enjoyed reading each chapter of this volume, yet I must say that, when reading the Handbook from beginning to end, I had difficulty seeing its principles of organization. Some chapters seem to group in twos and threes, but I was puzzled, for example, by the separation of the chapters on performance and aspects of variation (in the dating chapter) from those on genre, meter, style and language by chapters on content and on comparison with archaeological material. Fulk offers a very nice discussion of motivations for editorial choices which I had expected ten chapters earlier in “The Editing of Eddic Poetry”. Other chapters seemed overly-specific for a handbook of this scope. I enjoyed and benefitted especially from those chapters which seemed to fall outside what I would expect for a handbook, but the same chapters also shift the Handbook toward being more of a collection of articles rather than a handbook proper. This will certainly be an enduring volume in the field, but I suspect it will become used more as a collection of articles than as a handbook for students to read from beginning to end. A Handbook of Eddic Poetry. Myths and Legends of Early Scandinavia is a high-quality collection that will be of value and interest to students and scholars of all levels. Its chapters offer overviews of essential topics that will certainly be of use in university courses and that can be practically referenced in current research for their concentrated and up-to-date surveys and discussions. The collection also includes valuable new research on more specific topics in eddic poetry, both in case studies of more generally oriented articles and also in chapters on more specialized topics. This significant volume will be an important addition to any university library, and I hope that it will soon be available in an affordable paperback so that students and established scholars can keep a copy on a shelf at hand. Clover, Carol J. & John Lindow 1985: Old Norse–Icelandic Literature. A Critical Guide. London: Cornell University Press. McTurk, Rory 2001: A Companion to Old Norse–Icelandic Literature and Culture. Oxford: Blackwell. Frog is an Academy of Finland Research Fellow of Folklore Studies, Department of Philosophy, History, Culture and Art Studies, University of Helsinki.